There are a couple of old sayings: " Never swim alone" and "where there's water, there's danger" and certainly they are truisms. Swimming pools claim thousands of lives each year in accidents. From toddlers who do not understand how to swim, to persons having heart attacks while swimming, pools cause severe injuries, some heartbreakingly fatal. Las Vegas is no exception to the risk. Every year, children make Las Vegas News headlines after tragically drowning for failure to secure swimming pools. Certainly, nobody would leave a child on the brink of a cliff, yet they often will not secure a door or have a child safety gate installed when they have a pool installed. Pools have multiple hazards other than just the water. Pools are made up of systems of equipment that each can be defective. Pool pumps may have to much suction causing limbs to be unintentionally pulled through the drainage systems. It wasn't until recently that most municipalities decided that swimming pool building codes need to be changed to prevent such horrible deaths causing retrofits to the faceplates on drains. The consumer Product Safety Commission CPSC issued a recall of suction outlet drains given the numerous complaints of swimmer entrapment caused by the inability to free themselves from the suction. Nearly all the major manufacturers including Hayward, Pentair, Paramount, AquaStar, A&A, Lawson, Rising Dragon, and Waterway all had recalled drain covers. If you know someone who was harmed by a defectively designed drain cover call the expert Las Vegas pool attorneys at Benson & Bingham. Slip and falls are very common occurrences at commercial pools. The pool areas often fail to have slip resistant flooring and choose looks over safety function. When water is present, any surface not coated or made for slip prevention can be very dangerous. Failure to warn potential swimmers of pool depths can lead to divers and pool jumpers being paralyzed. Pool depths must be clearly marked to warn potential swimmers of the pool depths. Broken glass and other objects can present painful experiences for swimmers who my step on broken glass in a pool. Often, pools do not enforce the plastic cup only policy, which can lead to latent dangers in pools. Most building codes now prevent diving boards for the obvious hazards. Slides must be regularly maintained and provide enough water to lubricate the ride; side enclosures must also contain any riders as to avoid accidental premature departure from the slide. Pumps and equipment can be under extreme pressure causing unintentional explosions of compressed air and water. Typically housing filters and pumps are where this pressure can build up and if the housing was not properly assembled, a pool maintenance company or manufacturer may be too blame. Drownings often happen because of medical episodes, exhaustion, alcohol intoxication, and improper supervision. THey can happen so fast, and most are preventable. If you have questions about a drowning where someone else may be to blame call the swimming pool lawyers of Benson & Bingham. Failure to keep a pool light operable limits the swimmer from being able to judge distance and depth. Pool owners that may be in a cost saving mode may keep lights off to avoid expense. 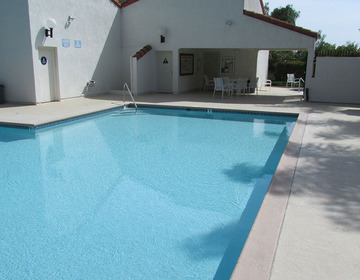 Often the pool owner will have a timer that is not maintained. This can lead to dark water causing unknown hazards for jumpers and divers, and those who are swimming. Lifeguards may not be legally necessary at a pool, however, the law will hold business owners accountable for failure to provide if the pool is a major attraction. Warning signs may be perched and noticed by swimmers, but often they are discounted. Swimming at your own risk is true to some extent, but there may be liability imposed if the facts are proper. Benson & Bingham grew up in the Las Vegas area and understand the dangers of swimming pools - Contact Us Today.